An adjustment is an effective form of treatment that involves applying a gentle pressure to stiff and sore joints. The adjustment loosens the joint and surrounding muscles, to restore proper movement and joint function. The purpose of this safe and natural procedure is to improve spinal function, nerve function and general health. Generally chiropractic treatment does not hurt, although in some cases patients may experience short-term discomfort which should ease quickly. Your chiropractor will advise you if this is likely to happen and will tell you how to reduce any soreness. Your chiropractor will try to get you better as quickly as possible. The speed at which you get better is dependent on: your particular condition, its severity and the length of time that you have been suffering with it. Patients respond at different rates, some report immediate improvement after their first treatment. Some patients need more time for healing to take place and will notice the benefit of treatment in a few weeks. At the initial consultation, your chiropractor will be able to give you a clearer idea of how many treatments you will need, based on your condition, its severity and your lifestyle. Typically, newer injuries will require less treatment, and as long as there is no severe tissue damage, good improvement will often occur within 4 – 6 treatments. Absolutely not! Some patients rely on chiropractic care to help manage episodes of spinal problems. Others include chiropractic as part of a plan of ongoing preventative care, similar to seeing your dentist regularly for a dental checkup. Most patients find that periodic chiropractic checkups help keep them in tip-top shape. Patients, who are very active or very inactive, have physical and stressful jobs, have underlying reoccurring spinal problems or those people who just want to be at their very best, find that a chiropractic check-up every few months is helpful in preventing injuries and maintaining good health. How long you benefit from chiropractic care is up to you. Yes, chiropractic is remarkably safe when a fully qualified practitioner carries out treatment. Numerous studies have shown that Chiropractic treatment is significantly safer than common alternatives such as long-term use of painkillers, anti-inflammatory medication or surgery. Chiropractic treatment is also safe and suitable for babies, children and pregnant women. What if my pain is not coming from my joints or muscles? On your first visit, your chiropractor will do a thorough examination. If your symptoms and the examination indicate that you require further investigations or that you need to be seen by a consultant, your Chiropractor will correspond with your GP outlining the necessary findings and recommendations. How is chiropractic different from physiotherapy and osteopathy? Chiropractors, osteopaths and physiotherapists all treat musculoskeletal complaints but their treatment methods and theories do differ. Physiotherapists operate mainly in the NHS. They tend to treat musculoskeletal problems with electrical therapies e.g. TENS, Ultrasound and the heat lamp. They also place particular emphasis on remedial exercises. Chiropractic and osteopathy have much in common. Both professions look at patients holistically and address the musculoskeletal system of patients using manipulation as a primary means of treatment. 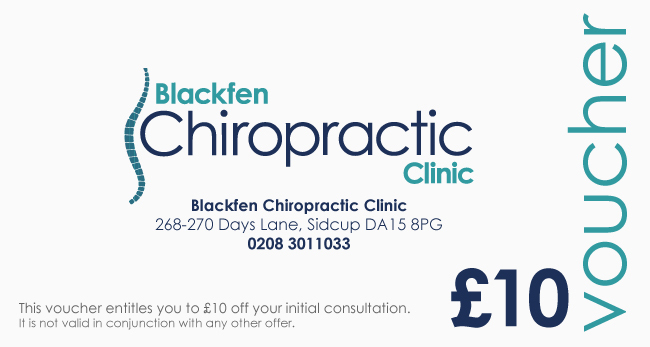 Chiropractors and osteopaths operate mainly in private practices. Both will advice you on relevant home exercise programmes and lifestyle changes that will aid your recovery. Chiropractors believe that their treatment helps lesson nerve irritation caused by the misalignment of the spine. Osteopaths believe that their treatment aids blood flow to injured structures. Both professions have statutory regulation and the important factor is that you ensure your practitioner is registered with their professional body accordingly. How do I know whether I have made the right choice of treatment? If you are comfortable with the treatment you are receiving, and you are getting better, then you have most likely made the right choice. Different people will respond to different methods of treatment, and you have to choose which one is right for you. No. Chiropractic is a primary contact health care profession meaning that you do not need a referral from your GP to visit a Chiropractor. You simply need to call the chiropractic office to make an appointment. Registered Chiropractors are able to assess and diagnose musculoskeletal conditions and it is encouraging to note that GPs are recognising chiropractic as an effective complementary treatment, particularly for back pain. What causes the “popping” noise in the adjustment? Not all adjusting techniques cause the “popping sound”. Research shows that the sound is caused by gas rushing in to fill the partial vacuum created when the joints are slightly separated. There is a release of CO2 and nitrogen gas which is not harmful in any way. Is it bad to crack my neck and back myself? Yes. You cannot properly adjust your own spine. You may be causing more harm than good. The need to crack your back is often a sign of an underlying back problem. By cracking your back you tend to create too much movement in the areas above and below your main problem. This only serves to compound the problem you may already have. Self-administered “cracking” typically provides very transient relief if any at all. The chiropractor is trained to detect and treat the main concern in your spine and typically this will reduce the need for you to crack your own back. Not even chiropractors adjust their own spine, they will get treatment from another qualified chiropractor. Yes, chiropractic care is suitable during and following pregnancy. Pregnancy should be an enjoyable life experience but often it is associated with weight bearing and pelvic changes along with postural adaptation. Chiropractic treatment offers safe, gentle relief of discomfort during pregnancy. Is chiropractic just for bad backs? No. Chiropractors treat low back pain (both chronic and acute), neck pain , shoulder pain (including frozen shoulder), headaches (including migraines) as well as other joint-related conditions. A range of musculoskeletal conditions including minor sports injuries and postural imbalances may be helped by chiropractic care. Should I bring my child to a chiropractor? Yes. School bags and falls during sport or play can put stress on the spine, which can go unchecked for years. Chiropractic techniques are suitable for children at all stages of development.